A murder is always newsworthy. But not all homicides get the same range of coverage – some make the national news, others feature just in the local press and others are barely covered at all. Families should think about contacts to the media. You don’t have to talk to them – but sometimes it can be useful. They are in a position to ask questions of authorities that ordinary members of the public often cannot reach. The media are likely to be interested in a murder case on a number of different occasions – particularly if there is a trial and a subsequent investigation by the health authority. In the confused immediate aftermath of a murder, journalists often have very little information from which to write their story. Inevitably some of them will get their facts wrong. This can be distressing to victims’ families, but the problem won’t be corrected until the journalist knows about the inaccuracies. If families do have something they want to say (or correct), writing a short press statement can make it more likely their views are reported accurately – whilst also helping the journalist do their job to cover the story properly. Despite the hard bitten stereotype, most journalists are sympathetic to victims’ families, and few enjoy knocking on victims’ doors uninvited. 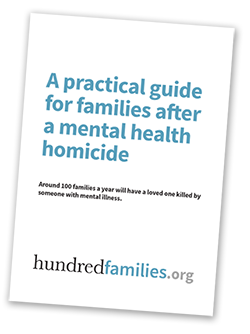 If someone has been killed and the killer not found, then it can be very useful for families to engage with the media to ask the public for information. Typically in such cases the police would organise a press conference where family members can make a statement, or answer questions. Usually local TV crews, radio and newspaper reporters will attend. If necessary the family liaison officer, or a police press person will be able to help with drafting the statement. Such press conferences, whilst often extremely difficult emotionally, can sometimes be very effective. Sometimes it can also be helpful to release a photograph of the victim to the press – the clearer the better. This can help people remember there was a real victim in the case who was not just a name or a statistic. Photos can usually be distributed to the press through the Police Press office. It’s likely the same photo will be used whenever the media cover the story so families might want to choose one with some care. The Police may also issue their own press statements which will record the bare facts of the incident as they understand them and which may cover significant developments in the investigation. These are given out to the press and are usually published in the news section on the forces’ own website. It’s also not unusual after the incident for families to be contacted by local press agencies offering to write an article for magazines such as Take a Break, Chat, Woman or similar. They may or may not offer a small fee. They would want to send a journalist to interview you, who would then write the story as if you had written it yourself. They would also want access to several photographs of the victim. Some people find this helpful – others less so. Once someone is charged the media will usually report the fact and give some very basic information about the accused. The defendant is ‘innocent until proven guilty’ and under the Contempt of Court Act nothing the press report can be seen to prejudge or influence the case in any way. If they do they’ll be subject to heavy penalties. Typically at this time, the press may run ‘tribute’ pieces – about the life and background of the victim, with contributions from families and friends – but they wont discuss the actual circumstances of the killing itself. Depending on the circumstances of the case, there may be press interest at the time of the trial. The media can usually report anything that happens in open court – statements by the judge, prosecution and defence lawyers, and any witnesses. There may be some restrictions however if children are involved. If a victim impact statement (see Court Cases page) is read out prior to sentencing this may also be reported. When the case is over journalists might approach families for their reaction. In some cases Family Liaison Officers can read out statements written by the family on their behalf if necessary. The police may also issue a press statement and if there is a conviction, may also release a photograph of the defendant – usually a custody mug-shot. Health authorities don’t usually welcome press coverage of mental health homicides. Typically at the beginning they’ll either say they can’t comment because of ‘patient confidentiality’ or because an ‘inquiry is underway’. The press may cover the start and publication of an inquiry – but only if they know about it. Sometimes there will be no coverage at all. If an inquiry is published and is likely to raise press interest some health authorities spend thousands of pounds hiring media consultants to manage and improve their press image. Sometimes families may have not been sufficiently involved with such inquiries, or they may dispute the findings. In such cases letting the press know can often be useful in trying to get answers. More information is in the Homicide Inquiries section below. Health Authorities employed media consultants for the release of Inquiry reports on Daniel Gonzales and Peter Bryan (amongst others).